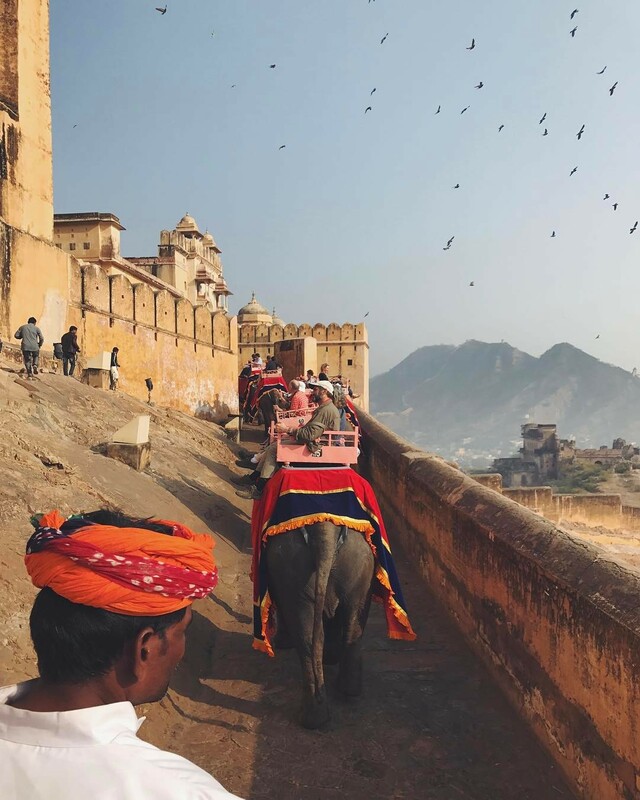 Today, you can’t scroll through your Instagram feed without seeing influencers and pals posting photos of Jaipur, India’s ‘Pink City.’ The capital of the Rajasthan state, Jaipur is bustling with people and bursting with color — most notably, shades of delicious pink. But, contrary to popular belief, this Pink City didn’t happen by chance. In an effort to give a warm welcome to the Prince of Wales and Queen Victoria in the late 19th century, Maharaja Ram Singh of Jaipur had the entire city painted in pink — the soft and sweet color of hospitality. The color grew on the residents and stuck over the years, with citizens continuing to paint the city in blushed tones to this day. In fact, the color has become so ingrained in the city’s identity that the municipality now requires residents to maintain the vibrant pink color of their buildings. Besides its pink facades, this city is overflowing with other must-see, Insta-worthy spots and monuments. Whether you’re trekking along the golden winding walls of the Amer Fort, frolocking through the lush gardens of the City Palace or standing in awe of the rainbow Patrika Gate at Jawahar Circle — Jaipur is going to leave you in a colorful trance. So, are you ready to be welcomed like royalty to the Pink City? Fair warning, these photos may induce serious, unrelenting wanderlust. Nahargarh Fort might have been built to protect the Pink City, but don’t let this imposing fortress fool you — it also doubled as a sprawling palace. You’ll be treated to decadent temples and jaw-dropping structures that serve as picture-perfect backdrops. 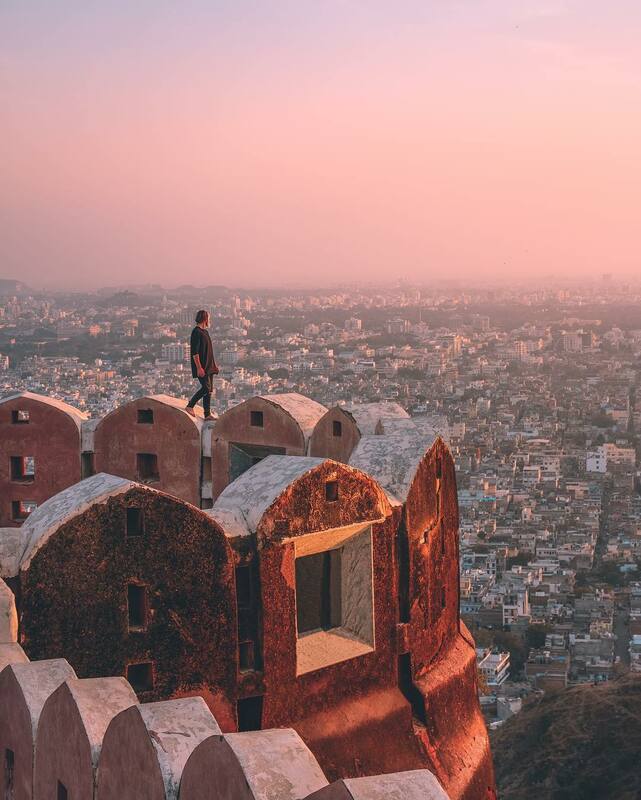 Plus, situated in the hills, Nahargarh Fort is one of the most stunning Instagram spots in Jaipur. Panorama shots, anyone? 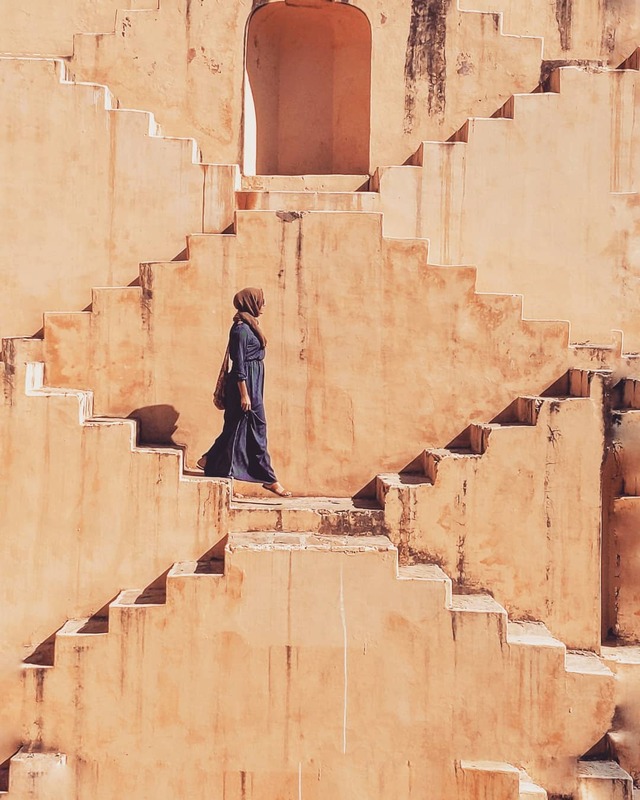 If you go to Jaipur and don’t take a photo on these famous steps, have you even really visited the Pink City? This 16th century rainwater catchment has taken over the ‘gram in the past few years because of its golden, symmetrical staircases which make the perfect backdrop for boomerangs and those oh-so-casual walking shots. And while Panna Meena Ka Kund is a public space, we’ve heard a few eager locals will try and charge tourists for visits — so be prepared. From all the Instagram photos flowing out of this famous place, you’d probably have no idea that just past these gorgeous gates is a vibrant, verdant park. The Patrika Gate is just the entrance to Asia’s largest circular park, each colorful pillar representing a different era in the history of the Rajasthan State. While you’ll probably come here for an epic walk-away or over the shoulder shot, we do hope you’ll take some time to explore the gardens, too. The Amer Fort, also known as Amber Palace, is actually just outside the Pink City center overlooking Maota Lake and the dusty Aravalli foothills. Made out of sandstone and marble, this opulent palace, featuring intricate wall carvings and regal staterooms, still manages to look like it was erected out of the arid land in which it resides. 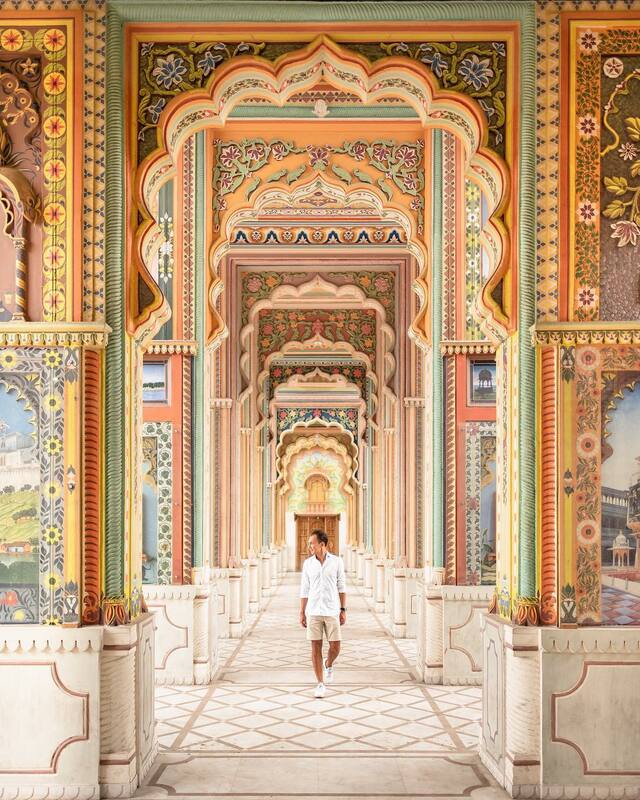 There’s clearly no shortage of beautiful shots at Amer Fort — from the pastel colored designs pictured above to the lofty courtyards and fortress walls that snake around the palace itself. 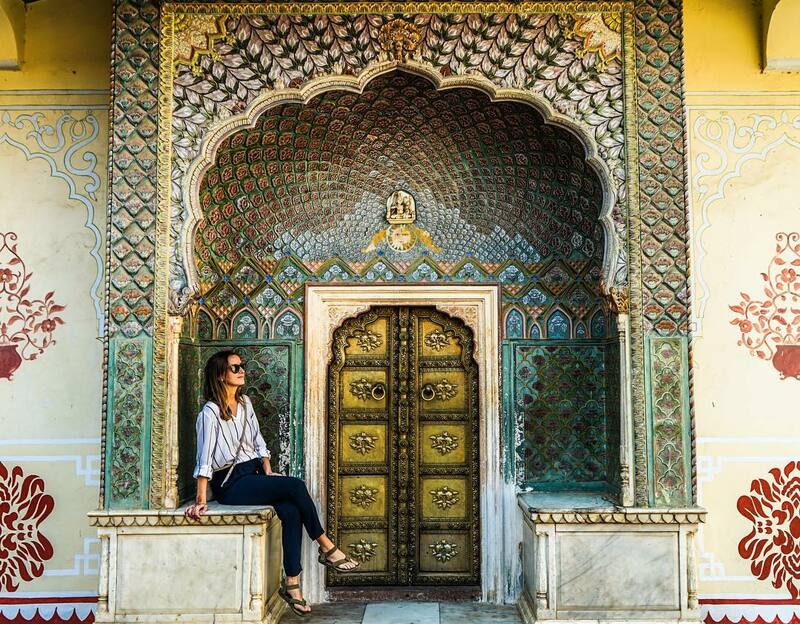 A compound overflowing with lush gardens, sprawling courtyards, and buildings, Jaipur’s City Palace is quite literally an (Instagram) oasis in the middle of the Pink City. A mix of Rajasthani and Mughal over the centuries, there are seemingly endless photos to be taken here — from the shimmering palace doors displaying the seasons to the rainbow Peacock Gate, pink Diwan-I-Khas room, and the famously blue Chhavi Nivas. If you want to snap photos that look like you have the palace to yourself, head here first thing in the morning or in the late afternoon. 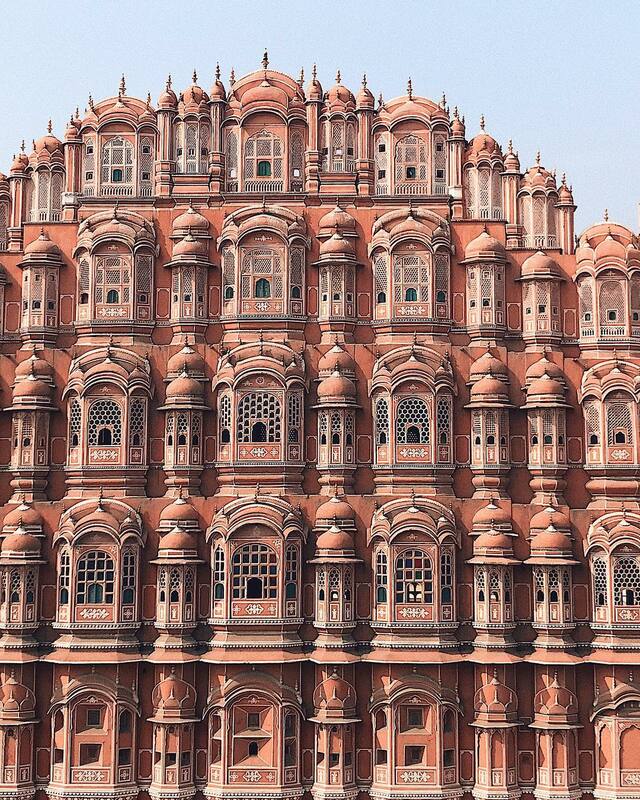 This building has gained some serious fame recently, and it’s easy to see why Haha Mahal, or “The Palace of Winds”, is one of the top Instagram spots in Jaipur. With a millenial-pink stained facade, never ending display of beautiful windows, and a towering disposition, this landmark was practically made for selfies. In all actuality though, the red and pink sandstone palace was made for local royalty and this spectacular wall is just the back. The rest of the palace just as feed-worthy — so be sure to check that out, too.